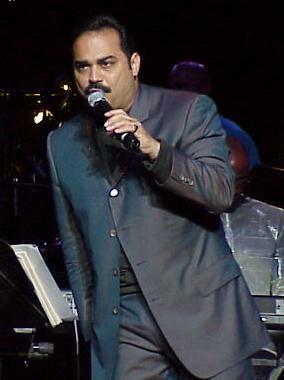 These photographs of Gilberto Santa Rosa were taken at The 24th New York Salsa Festival that was held at the world famous Madison Square Garden in New York City on September 11th, 1999 at 8:00 PM. Also played, The Sir George All Star Band, featuring world class Latin artists including Gilberto Santa Rosa, Victor Manuelle, Tito Nieves, Elvis Crespo, D.L.G. (Dark Latin Groove), Milly Quezada, Sergio Vargas, Frankie Negron, Brenda K. Starr, Nora, Charlie Cruz, and George Lamond. The show also included a guest appearance by Johnny Pacheco, who came out to play the flute with D.L.G, as well as other guest appearances. Highlights of the show included a duet by Brenda K. Starr and Frankie Negron, a duet between Millie Quezada and Sergio argas, a duet between Millie Quezada and her son, and another duet by Gilberto Santa Rosa and Victor Manuelle. There were also numerous dancers on stage and the show included fire-works. Paco, a well known disk Jockey from Mega 97.9 in New York City, was the Master of Ceremonies. Photographs by J. Fernando Lamadrid. (c) Copyright 1999 www.justsalsa.com. All Rights Reserved. Please do not use these photos without asking the permission of justsalsa.com and giving photo credit. Please give us your feedback.